Basic Blocks Often Mess With My Mind! Ok! I am just going to admit it! Some of the most basic things about quilting really mess with my mind! This was an attempt at an improv log cabin square…and I call it a fail! My strips are not in order for that log look and more! To me, it looks more like a messed up courthouse steps block. 2) understanding this basic square so I can learn to make it modern. I am using the pattern from Suzy Quilts. I am using solids to keep it even more simple…I think. This pattern creates nice even strip sizes, but something bugs me about the center. I think I don’t like the two same-size squares next to each other. I am wondering if the log cabin block is just not for me! However, I do like the bright colors in the first set of blocks. And (for the most part) I did grab and go! I also figured out that the 2″ strip width in the directions from Marzi should work with any width. I’ll have to give that a try. And maybe I will try the wonky look…that for another blog! What do you think of the log cabin block pattern? Do you have a favorite way to produce this block? Do you have tips and tricks you can share? This is part of my commitment to the process pledge! It IS all a process…good, bad, or ugly! If you are a quilter, you must know of Yvonne at Quilting Jetgirl! Today she shared some really great tips on creativity. If you have not read them, check it out. And be sure to read the comments too, as many of her followers have posted some good ideas. In a similar vein, Jacquelynne, at The Art of Home, shared some thoughts on finding time for creativity in an email to subscribers. There were lots of good ideas presented, but one thing that really rang true for me was this…”In order to say Yes to your priorities, you have to say No to something else.” I am not suggesting that we should all be neglecting other things in our lives, but it is so true…we can always find something else calling to us that creates guilt over spending time doing what we are passionate about. What are you going to be doing? As a side note, I will also throw in here what I bet some of you may be feeling…reading all the blogs I follow, Instagram, Facebook, etc. is eating up my time. Well, I am guilty of that, as well, but I will say that my creativity is also fed by those who inspire me via these sources! I am thankful for them! What’s a person to do? Happy quilting…or whatever it is! Hello friends out there in the blogosphere! Looking for some help. …aren’t they adorable? Well, here is the problem. This is it…the poem is imcomplete. Would any one of you crafters out there just happen to have cross-stitch patterns like these? They are at least 20 years old and I can’t find anything like them. We would like to make something in mom’s honor. Perhaps a quilt for the upcoming children (no time soon!) who will be her great-great-grandchildren! Of course, that would be only one quilt and it would have to be passed around. Still thinking on that idea and have some other possibilities. At any rate, I know this is a long shot, but worth asking, as this community is so caring and helpful. Feel free to share any thoughts you may have on a project to incorporate these items too! I doubt that any of you have ever had this issue, but for a long time, I have been amazed with the speed at which people complete their “quilts.” I’ve always thought of a quilt as a project that was bed-sized…even if for a baby bed. Yes, I have enjoyed participating in swaps, but actually never thought of those finished pieces as quilts. I have called them “minis”… and not the same, in my opinion. Keeping track of our finishes is one thing, but finished quilts, another. Well, guess what? I think I will be having a lot more finished QUILTS in 2018 because, since paying more attention, I see that they can be any size!!!! I plan to adopt that thinking. So, how do you feel about this subject? What do you call a “quilt”? BTW, what size to you think this one is??? A picture can be very deceiving as to the size of these beauties! Process Pledge – not my idea, but a great idea! Here’s the process pledge. Take it, shake it, make it yours. I, Valorie – @facetfully, pledge to talk more about my processes, even when I can’t quite put them in the in words or be sure I’m being totally clear. I’m going to put my thinking and my gut feelings out there. The pledge, above, is copied from Rossie’s blog post, so, if you use it, please give her credit!!!! It is important to keep it real. We all have days when we feel uninspired, when our plans don’t come together like we imagined, and when we just want to throw something in the trash. Maybe our points don’t match, our seam ripper is getting too much use, or our fabric bleeds…who knows what it might be. Hopefully, these days are greatly outnumbered by happily creative days when we want to post about successes, finishes, and all the good stuff too! 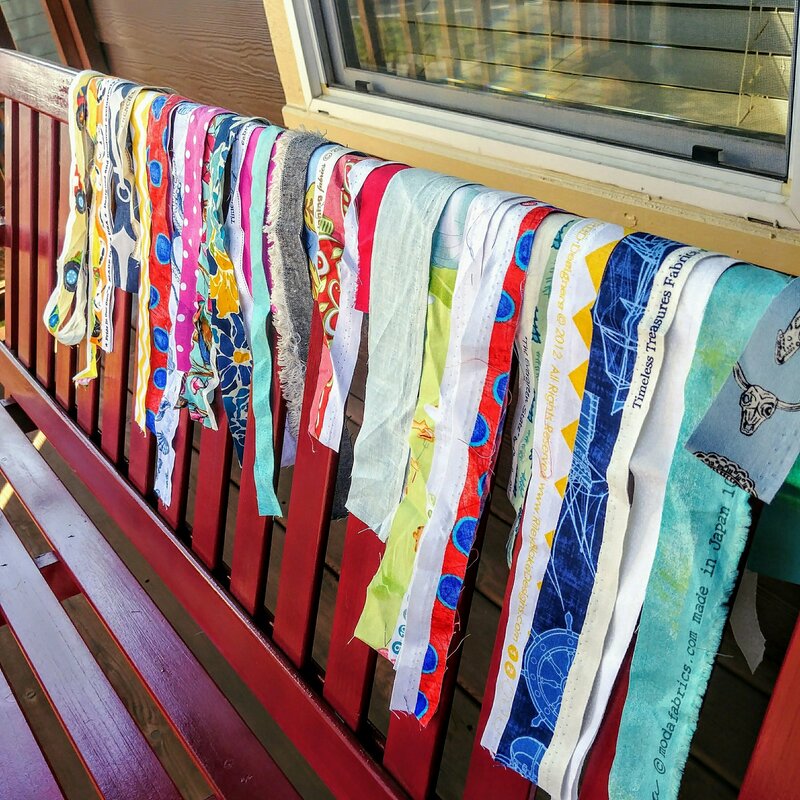 As I recently posted, the quilting community, via blogs, Instagram, and more, keep me exceedingly charged up to do and learn more. Let’s keep sharing…all the bits of the process! The first REAL quilt I ever made was for my daughter. I am reposting this today, as a reminder of how important I think quilts are, how they connect us, and how much they mean…to the quilter and, hopefully, to the receiver. They just might become heirlooms! I won’t go into all the details of that quilt, but you can read about “Starry Nights” here. I do want to talk about the growth process that is part of becoming/being a quilter. This first quilt was a big undertaking for me! I was thrilled to make it and I do love it. That could be because I love the one who requested it so much and becuase I love blue. Oh, and then there is the completion of a challenge! I recall working on it dilligently and all the inspiration from my “sewmate”, @judemadeit. She was a much more advanced quilter than I. I wondered if I would ever get this done and, indeed, it took much longer than I expected. I have seen it on my daughter’s bed by now, and it is very special to me! All that said, I have come a long way in my quilting journey. Don’t misunderstand, I have a long way to go! Creativity can be a friend or foe. There are UFOs, WIPs, failures, and happy results. 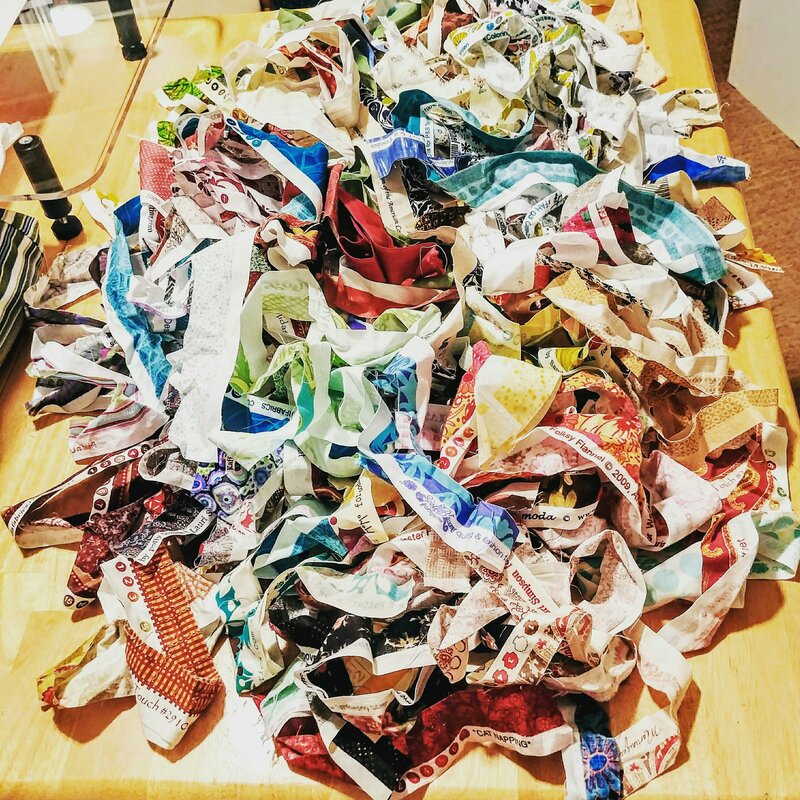 I have developed into more of a modern quilter than “Starry Nights” depicts, I have challenged myself with FALs, QALs, swaps, classes, FMQ, home machine quilting, and more. My quilting style is evolving. A sincere thanks goes out today to all the friends I have made on this journey! Thanks for the blind support through this blog, through Instagram, through your blogs, through your generosity in swapping and teaching. This is, without a doubt, a wonderful community to be even a small part of! 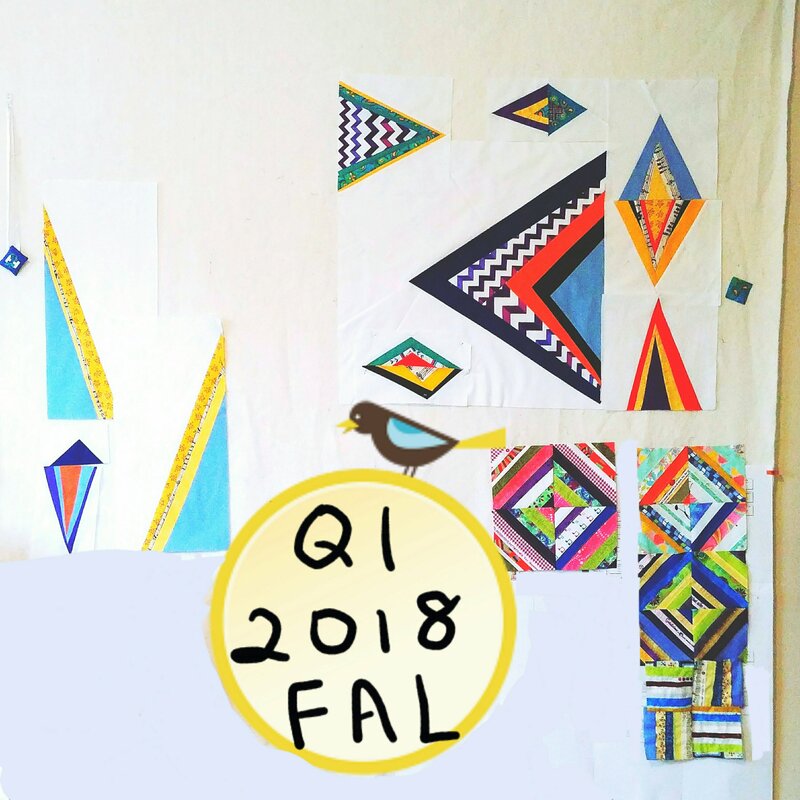 I look forward to continued growth AND to meeting some of you in the soon to be, QuiltCon2018 in Pasadena! Alright already! No one has truly challenged me to this, but I FEEL challenged to post and work on my 1Q Finish-A-Long list. Thanks to many of my IG quilty friends and bloggers I follow who inspire me! 1. 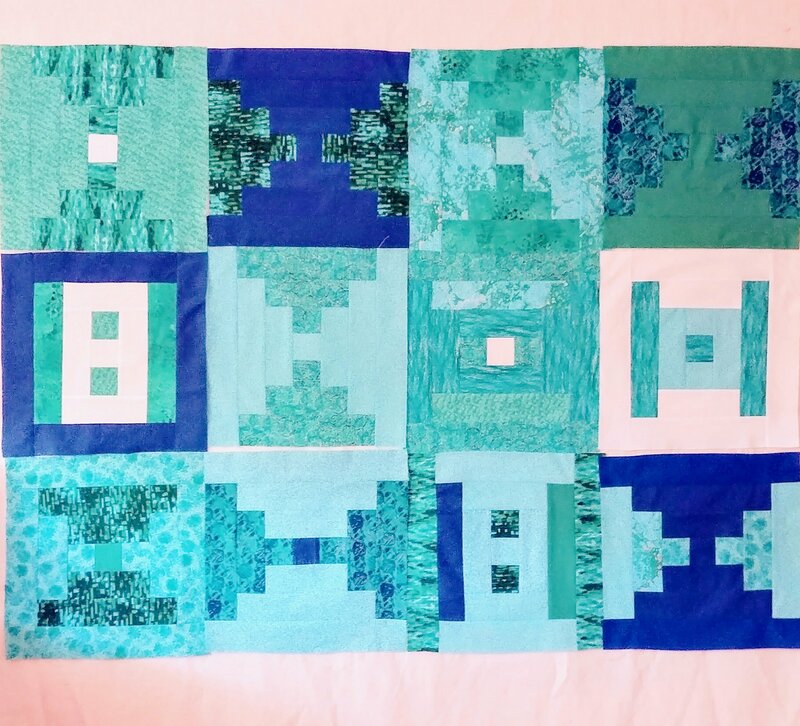 I have a flimsy made up of courthouse steps blocks in pretty blues, greens, and aquas. I am calling it “Caribbean Courthouse Steps” for now… original, I know! 2. Improv triangles…these were a test, but “waste not, want not”. Plus, I like them. I just need to make more and decide what they might become! 3. Ditto the improve triangles for the selvedge blocks…I love making them and they could end up being so many things! That is it…keeping it a little short, just to see if I can actually get to this much! Of course, there will be the regular bees, swaps, etc., in addition! 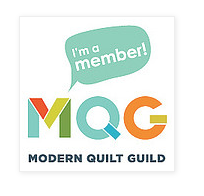 AND I am going to my first QuiltCon in February!!! !